desk to activate the medical clinic's emergency response team to take over the emergency. Dental personnel should be standing by at the entrance where medical personnel will arrive in order to direct them to the emergency. Please note that not all dental commands have the same procedures as described above. You must read your own command's instruction on emergency medical procedures for your specific command. Respiratory failure and cardiac arrest occur when a victim's heart suddenly stops beating, causing the blood to cease circulating. A victim of respiratory and cardiac arrest must receive cardiopulmonary resuscitation (CPR) within 4 to 6 minutes after the heart stops beating. You must be able to recognize what is wrong and provide immediate emergency medical treatment including basic life support (BLS) until the medical department arrives. BLS is the attempt to restore lung and heart function. These procedures can be summarized in terms of the ABC's of basic life support. The primary emphasis is placed on maintaining an open airway to counter upper airway obstruction, restoring breathing to counter respiratory arrest, and restoring circulation by chest compressions to counter cardiac arrest. Heartsaver course - teaches learners in one- rescuer CPR, management of foreign-body airway obstruction, and the use of barrier devices for ventilation. Pediatric BLS cours - teaches learners how to administer CPR and first aid for choking infants and children. Healthcare provider course - teaches healthcare professionals in one-rescuer CPR, management of foreign-body airway obstruction, two-rescuer CPR, the use of barrier devices, and (optionally) the use of an automated external defibrillator (AED). All dentists, dental technicians, and auxiliary dental personnel must be certified in the healthcare provider course for BLS if directly involved with patient care. Among the standard emergency equipment in the DTR is the hand-operated resuscitator (fig. 9-3), also referred to as a bag-valve mask. It allows the operator to rescue breathe for the patient without mouth-to- mouth contact. This device consists of a face mask and an inflating bag joined by a valve. A connector at the end of the bag allows the resuscitator to be connected to an oxygen supply. The mask is clear so the operator can see the patient's mouth in case regurgitation occurs. If this happens, gently turn the patient's entire body on the right side, wipe out the mouth, return the body to its original position, and continue to rescue breathing with the hand-operated resuscitator. Figure 9-3. 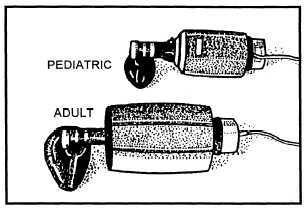 - Pediatric and adult resuscitators.